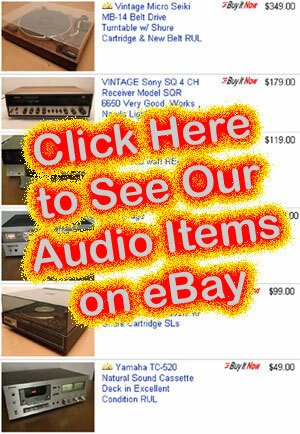 Vintage Audio Equipment For Sale! SEE and HEAR in our Centerville, Ohio Store! Why might you care about Analog vs. Digital audio? We live in an analog world, the human ear hears music as analog. The wires that drive speakers carry analog signals. Analog signals have infinite possibilities. Digital music signals are discrete or finite. Audio CDs store the music digitally. Turntables generate an analog electric signal from the vinyl record. Speakers receive analog signals to move air. Electro-magnets push those speaker cones against opposing magnets that act like springs. Very fast and strong changes in the electrical input moves the cones for the natural sounds that we enjoy. Good woofer speakers are large, heavy and literally create a breeze around them. Strong powerful amps are needed for great sound (even at low volumes). Turntable needles vibrate from the grooves in the record. This vibration then moves an electrical coil which produces electricity as an analog signal that gets fed into an amplifier. Vintage analog amplifiers do not digitally enhance or change the pure analog signal coming from a turntable heading to the speakers. 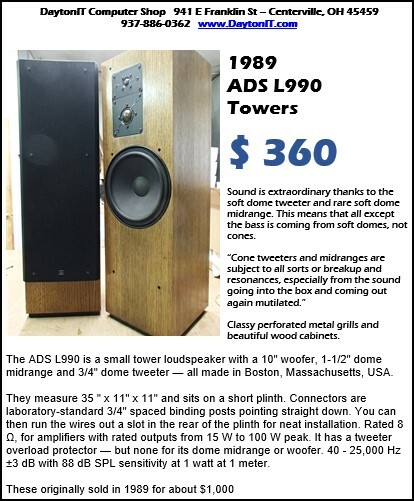 Great Amplifiers and Receivers need large electrical transformers and capacitors to be able to generate very fast and powerful signals to the speakers. 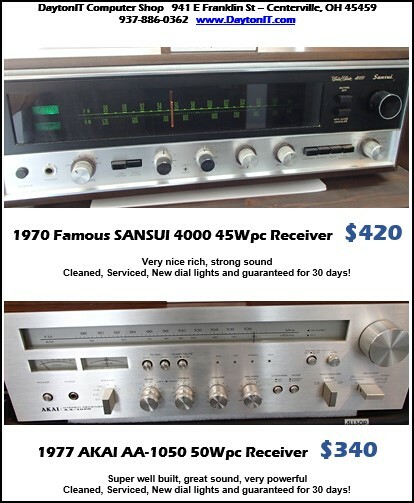 Vintage stereo receivers and amplifiers are very 'Heavy' and have no 'microprocessors or chips' just old fashioned electrical components, which is exactly what analog signals needs. These large components kinda give them torque in addition to overall power. Most Surround Sound Receivers do not have these Heavy Components for premium sound quality. Much of our music sources are digital. Digital sources compress the file / download size which greatly lowers overall sound quality, so the source of the digital music is very important. The other consideration is what component is converting the digital signal into a analog signal to input into your amp, it's the 'DAC' Digital Analog Convertor. A computer, laptop, tablet, phone or Bluetooth device might use a $0.25 microprocessor chip to serve as the DAC, you will want a better DAC then what these provide. Direct to Disc Albums: D2D These are awesome! 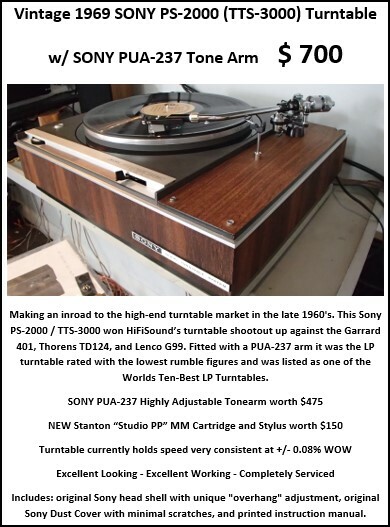 Typically they are made by recording thru all analog mixing consoles and then direct to the 'lathe' that records the actual vinyl master album. The music never goes to tape or digital recording for later mastering, the recording is made without multitrack recording, mix downs and overdubs, just mixed live for stereo. Spontaneity of performance is preserved as the entire side of an album is a non-stop continuous performance. We find the sound quality of these D2D albums to be awesome, super high highs, super low lows and excellent stereo separation. Excellent examples would be "Les Brown and his Band of Renown", "Benny Goodman the King" and "California Smoker". D2D is a real treat for your ears. Restaurant, Bar and Business Owners Note: Vintage Speaker Systems offer unique sound and become conversation pieces. If the music in your establishment is important to your ambiance then Vintage Speaker Systems become "Landmarks" for your establishment. Digitally Remastered Albums: Back in the 70's and 80's lots and lots of people listened to FM radio, FM modulation has distortion and quality problems with really high notes and really low notes. So when albums were produced and mastered back in those days they would intentionally back off on the treble and the bass to make the album sound better when the DJ at the radio station would play it over the FM airways. Mass production would also degrade the quality of the albums. Therefore these recently 'Remastered' albums provide higher highs and lower lows then the original album did. Currently you can buy the Fleetwood Mac Rumors album as Digitally Remastered onto (2) 180gram albums running at 45rpm providing very high fidelity. Digital Music and Streaming sources: Digital sources compress the file / download size which greatly lowers overall sound quality, so the source of the digital music is very important. Listed in order of quality: POOR - YouTube, iHeart, Pandora, Amazon, Apple, Google Play, Spotify, Tidal - BEST. Of course many of these have the free service and then a pay / premium service that can provide better quality. We use the Spotify Premium service at $10/month and with the computer 'desktop' application and they give us very high bandwidth downloads. Bluetooth Receivers: These connect to any stereo amp/receiver and are available for as little as $25. Bluetooth receivers have common Red/White RCA analog output connections to be plugged into your amp/receiver AUX or Tape In port. Your Laptops, Tablets and Phones simply connect to the Bluetooth Receiver wirelessly within about 20' into Vintage and/or newer amps/receivers. However, consider our comments about DAC and consider a good Bluetooth receiver at about $100. The Harmon Kardon BTA 10 at $80 does an excellent job both with it's Bluetooth reception and it's DAC function. AND by the way Computers, Laptops, Tablets and Phones can be directly plugged into your amp/receiver AUX or Tape In port using a 3.5mm (headphone jack) to RCA cable !!! 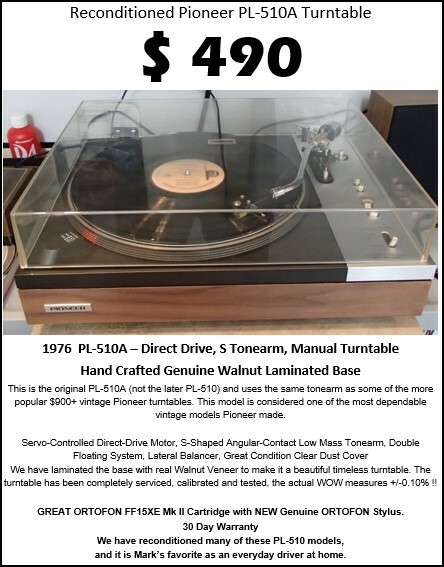 How do we get such great - often 'Original Owner' Vintage Equipment to sell? 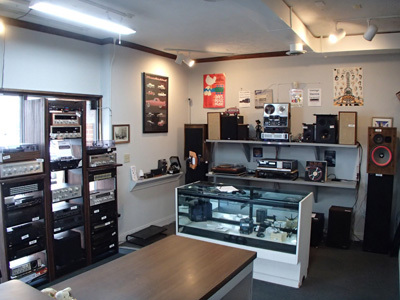 As an Ebay Consignment Drop Off Center, original owners find us and bring in their Awesome Equipment to sell. More info on the 'DAC' Digital Analog Convertor. A computer, laptop, tablet, phone or Bluetooth device might use a $0.25 microprocessor chip to serve as the DAC and they do a very poor job. The 'analog headphone jack' on these devices is very low quality! For computers and laptops there are USB devices like the 'DragonFly DAC' starting at $100 that provide excellent DAC functions. We use a DragonFly Black on our Spotify Premium computer and get 96000 Hz (an Audio CD Disc runs at 44000 Hz). If you are sending the digital music signal over Bluetooth it remains digital until it reaches the Bluetooth receiver and the Bluetooth receiver is then the DAC with analog output into a amp/receiver, so a good $100+ Bluetooth receiver can really improve quality. If you use the HDMI port out of a laptop into a surround sound receiver, the signal remains digital until it reaches the receiver and then the receiver becomes the DAC and can do very well. Audio CD disks store the music in a digital format. If you are using a Audio CD Player connected to the amp/receiver using the analog White/Red RCA cables then the CD Player is doing the DAC so a better more expensive CD Player should sound better. If the CD Player has Digital/Toslink/FiberOptic cable output going into a newer amp/receiver with this input then the amp/receiver becomes the DAC and could increase sound quality. 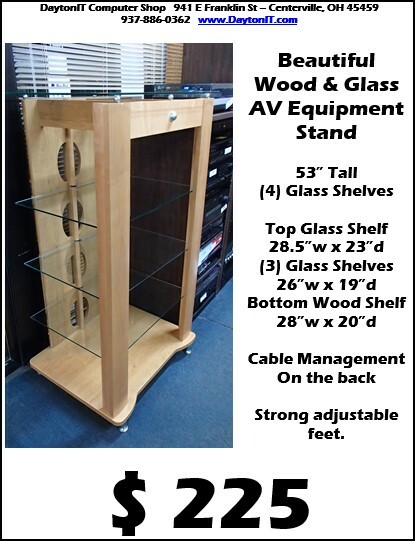 We service and test the equipment and provide a 30 Warranty on the equipment (except speakers) purchased in our store!! Surround Sound Audio Video Receivers AVR can vary greatly in 'Stereo Sound Quality'. Typically they are loaded with features like their claimed high wattage, internet connections and so on, but often lack in actual sound quality. We have used many different AVR models and have found some tips to really help you. If your main priority is good stereo sound, but you also want to great sound from your TV, all you need is a Center Channel speaker for TV vocals and a good pair of stereo speakers. You do not have to have rear surround speakers. And if you don't want a sub woofer the AVR will send the bass to your main stereo speakers. 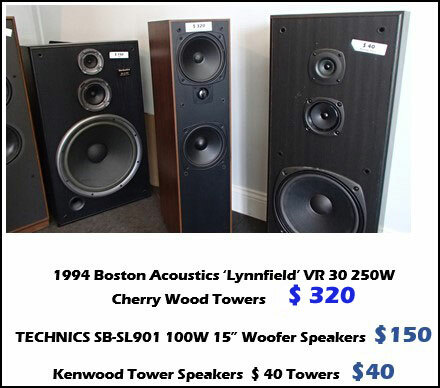 Most AVR units can provide all you want with just these (3) speakers, and you can always switch it to a Stereo mode for the best sound from your main speakers. We clean, test, repair and sometimes restore vintage equipment.